47" 1 - 0 : Chelsea haven't got going and now they find themselves behind as Brooks shows great composure to bring the ball down on the right flank, swing a cross in and Joshua King is there to slam the ball right-footed into the roof of the net past Kepa! 63" 2-0 : Where's the defending from Chelsea? They're all at sea at the back as Luiz dives into a challenge on Brooks and the ball deflects on to King. The forward unselfishly looks up and dinks the ball back to David Brooks. Luiz gets back but sells himself far too easily, and the Welshman cuts inside before reversing his shot into the bottom corner! 74" 3 - 0 : Chelsea have been torn apart this second half and now they stare at a big defeat as Stanislas unselfishly slides the ball across goal and Josh King strokes in his second, lifting the ball over Kepa! Some of the travelling fans have drifted towards the exits. 90+5 : 4 - 0 Would you believe it, Bournemouth have a fourth. Ibe's free-kick is met by the head of Charlie Daniels, and he flicks in his first goal in nearly 18 months to complete the misery for Chelsea! Afc Bournemouth : Boruc (7), Clyne (6), Cook (7), Ake (7), Smith (6), Surman (7), Gosling (7), Stanislas (7), Brooks (8), Fraser (6), King (8). 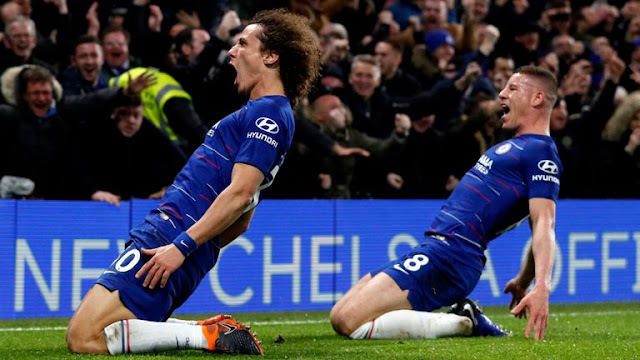 Chelsea FC : Kepa (5), Emerson (5), Azpilicueta (6), Rudiger (6), Luiz (5), Kante (5), Jorginho (5), Kovacic (5), Pedro (5), Hazard (5), Higuain (4). 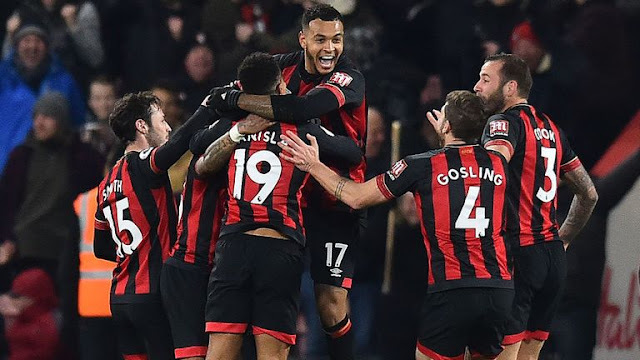 Bournemouth's Josh King has scored in each of his last two Premier League appearances against Chelsea at the Vitality Stadium.